Print the WSIKF poster competition guidelines and artist information form. These will need to be signed and returned with your entry. Artwork must be submitted by January 6, 2020. Artwork will be on public display at the World Kite Museum. The winning poster will be selected by the Kite Festival Committee in March. If you would like to view the past poster winners, they are on display at the World Kite Museum and on our WSIKF Poster Contest page. Limited edition printing will consist of 300 posters to be signed and numbered by the artist. Printing and proofing will be the responsibility of the kite festival poster committee. 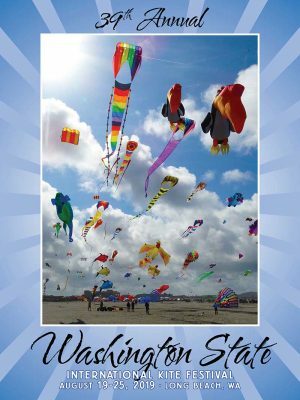 Entries must be delivered to the World Kite Museum, 303 Sid Snyder Drive, Long Beach, WA by 5pm Monday, January 6, 2020. Please include this signed and dated document with your entry. Please do not mat or frame your entries. It is the artist’s responsibility to sign and number the prints as soon as they are received from the printer. The Artist will receive 15 non-numbered posters which are not to be available for sale until after the Kite Festival. The artist will receive a payment of $750 payable within 30 days of completion of all signing and numbering of posters. An additional commission of $2.00 per poster sold through 8-31-18 will be paid by September 15th. The final payment will be made by January 20th. There is no commission due on any poster sold after January 1st. The artist may elect to buy any unsold posters after January 1st. The price would be cost plus 10% (cost of poster printing & the tube & caps). WSIKF retains the rights to print/publication. The artwork shall be: 18 inches high by 24 inches wide or 24 inches high by 18 inches wide. The title block will be added by the Kite Festival. Hall of Fame has Been Moved Upstairs!